Ethnic tension between Lithuania and Poland is a great gift to Vladimir Putin's Russia, says former Polish dissident Adam Michnik, editor-in-chief of the Polish daily Gazeta Wyborcza. 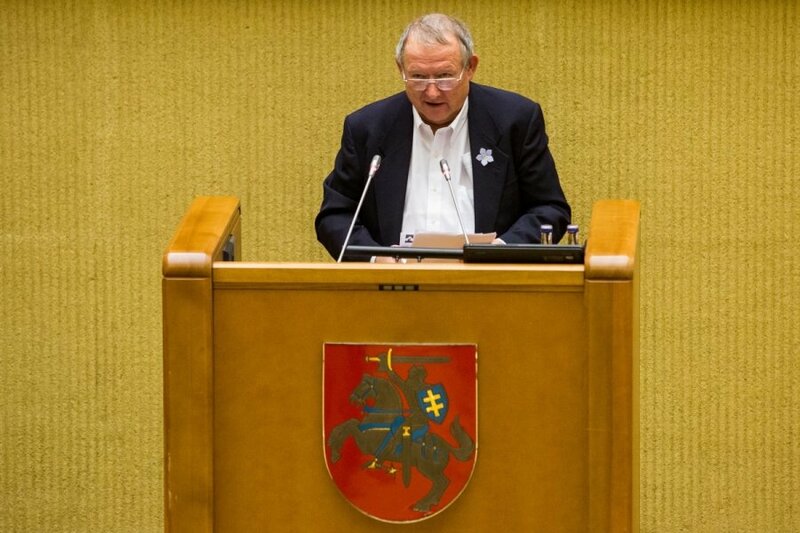 Michnik was awarded the Freedom Prize 2014 in the Lithuanian Seimas on Tuesday as Lithuania marks the Freedom Defenders' Day. "Let's remember the idea very clearly formulated by Putin's ideologist Alexander Dugin who once wrote that ethnic tension between Lithuania and Poland is a valuable element that, when possible, must be fuelled. 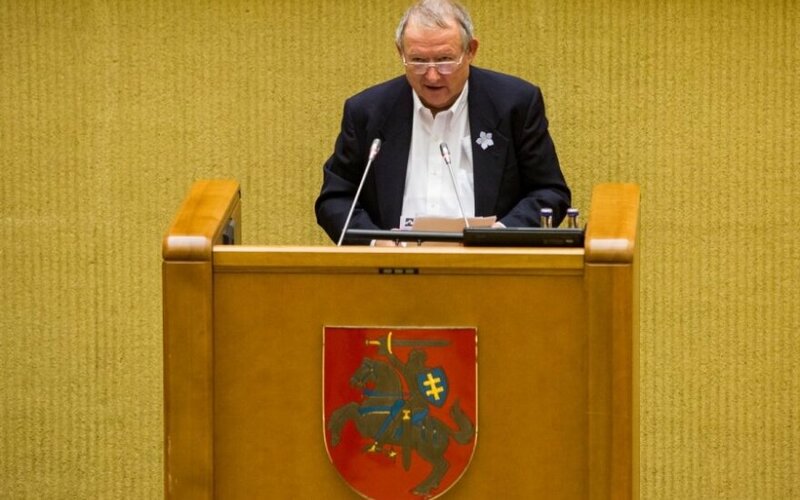 Let's think what a great gift the Lithuanian-Polish conflict on the spelling of names and bilingual street signs is," Michnik said, addressing the solemn sitting of the Lithuanian Seimas. In his words, Lithuanians and Poles should think "beyond our egoism and all those who are creating obstacles, have no imagination and are taken over by ethnic chauvinism, are acting against national interests of our nations". Speaking about the neighbouring country's position on Lithuania, Michnik said that "Poland's opinion about Lithuania is damaged due to a lack of knowledge". "Our task is to fill that void with real knowledge. Fortunately, the situation is improving, and I do believe those changes will continue," the Polish representative said. Reminiscing of the liberation from the Soviet occupation, Michnik noted that at the time Lithuania and Poland were much more united. He also named EU membership and the fact that there's no border between the two nations as their biggest achievements. "Although Poland was occupied by the Soviet dictatorship differently, what united us then was stronger than things that separated us. The old disputes are a thing of the past. We must remember and speak about them. We cannot change them but we can reflect on them. Vilnius is the capital of a sovereign democratic state forever. It is also part of Poland's historic memory, but the Poles renounced any revisionist ideas forever. It’s the position of the Polish state and the position of the Polish public opinion since 1989 at least," Michnik said. Michnik delivered his speech in Polish, although, he said, he had received a proposal to do that in Russian. But the former dissident joked that he did not want to give Putin a pretext to come to Vilnius or Warsaw to defend Russian-speakers. "Since I don’t want Putin to come to Vilnius or Warsaw to defend anyone, today I speak Polish and not Russian," he said. Earlier in the day, Michnik received the Freedom Prize 2014 which Lithuania established in 2011 to honour individuals and organizations for their achievements in and contribution to the defence of human rights, development of democracy, and promotion of international cooperation for the cause of self-determination and sovereignty of the nations in Eastern and Central Europe. The first Freedom Prize of 2011 was awarded to Russian fighter for freedom and democracy Sergey Kovalev. Antanas Terleckas, a former Soviet dissident and leader of the Freedom League, received the prize in 2012 and the 2013 prize went to archbishop Sigitas Tamkevičius who founded the underground publication, Chronicles of the Catholic Church of Lithuania. The prize is conferred at a solemn Seimas meeting on 13 January, the Freedom Defenders' Day.